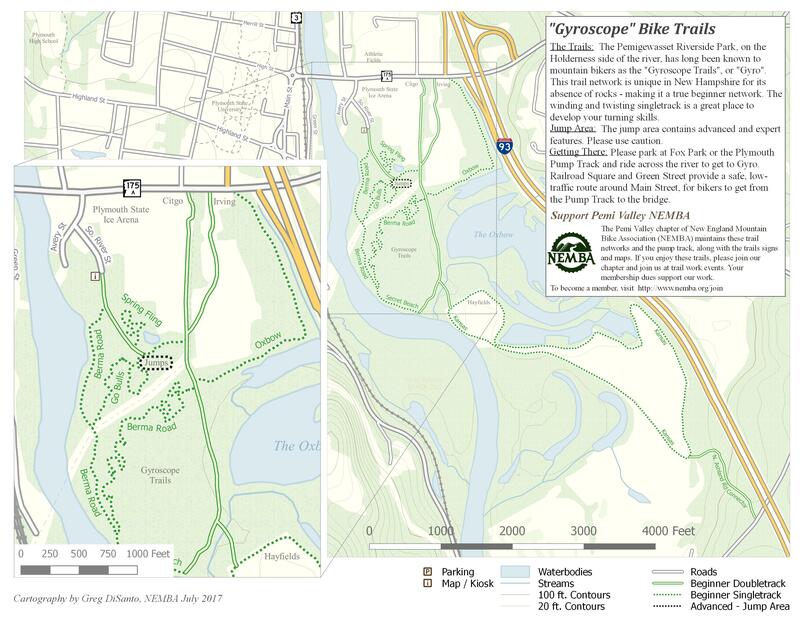 The Trails: The Pemigewasset Riverside Park, on the Holderness side of the river, has long been known to mountain bikers as the “Gyroscope Trails”, or “Gyro”. This trail network is unique in New Hampshire for its absence of rocks – making it a true beginner network. The winding and twisted single track is a great place to develop your turning skills. Jump Area: The jump area contains advanced and expert features. Please use caution. Getting There: Please park at Fox Park or the Plymouth Pump Track and ride across the river to get to Gyro. Railroad Square and Green Street provide a safe, low-traffic route around Main Street, for bikers to get from the Pump Track to the bridge.